In 2013 I published a book, The Invisible Hand in American History, based on the material here. The book is far superior to the material here. It is available at Amazon in paperback. History is important. Those who are unaware of history are, nonetheless, vastly affected by it and doomed to repeat past mistakes. What is history? Is it what we learn when we memorize a list of Roman emperors? British kings? Presidents of the United States? Napoleon's battles? The most important German generals during World War II? The most important legislation passed by the U.S. Congress? Clearly, history is about more than any one of these things, or even all of them plus such pieces of economic history as what were the major products of the thirteen original American colonies and who were the leading American industries in the late nineteenth century. A great deal of what happened in the past that was recorded has not been printed in any book, even as a brief summary. There is an enormous amount of information in old newspapers which appears in no book. The same is true of the Congressional record. In Spain they have records of what was shipped between it and the New World several hundred years ago that has not been published. There are many diaries, letters, and mercantile information whose contents you cannot find a hint of in any book. We don't know everything that happened in the past. While we've been here for millions of years, recorded history hardly goes back 2000 years, and the discovery of new information has often lead to drastic reappraisals of the past. Clearly, we are not dealing with an exact science. A recent, new method of analyzing the past is called counter-factual history. 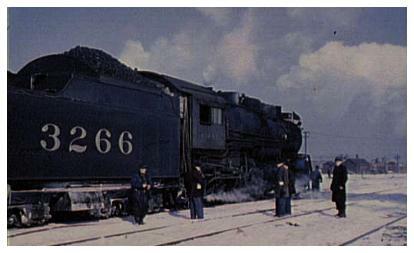 An example of this method is to evaluate the importance of the railroads by estimating what the impact of their absence would have had on the nation's economic growth and development. Many people think history is irrelevant to everyday life. This may be because the history courses they took involved remembering names, dates, places, and events, rather than how and why things happened. Most people are intelligent enough to learn from their own experiences. It is not intelligent to also learn from other people's experiences. The study of history is the study of the other people's experiences. Just as what you are is the result of what happened to you and what you did in the past, what our society is like today is the result of its past. You cannot really understand a person, a society, or an econmy without a knowledge of their past. The job of a historian is to find regularities in the sequence of past events so that he or for insights useful to us today in making decisions, making policy, and forecasting the future. The historian seeks to learn more about human nature by studying man's past. He or she seeks illumination about our present condition. He or she searches for guidance for our judgments and policies. Some, like Karl Marx, the father of communism, think that history has, so to speak, a plot. That is, society is evolving in a certain direction. Others disagree with the belief that society is evolving in the way Marx thought it was, and others argue that it is not evolving in any direction. But while there may be no purposeful evolution politically, socially, or economically, this is not true technologically. While knowledge of central heating and plumbing developed by the ancient Romans was lost for hundreds of years, over the long run mankind has steadily advanced technologically. Since the early 1800s this evolution has taken place at an unprecedented pace, and technological advance is a major reason why our material well being has improved so dramatically in this century. According to Marx, history is economics in action. It is the contest between individuals, classes, and nations for food, fuel, materials, and economic power. Political forms, religious institutions, cultural characteristics, claimed Marx, are all rooted in economic ralities. Even some of those who very much disagree with Marx's belief that history reveals that mankind is inevitably headed for a communist future believe that history is economics in action. The Crusades were, they claim, an attempt by the West to capture trade routes to the East, and the discovery of America was the result of the failure of the Crusades. That is, another route to the East was sought as a result of their failure. The French revolution, they claim, occurred because the middle classes had risen to econmic leadership and needed legislative freedome because it would promote their enterprises and trade. Also, they itched for social acceptance and political power in line with their economic importance. Historical perspective enhances our appreciation of current events. For example, those familiar with the history of the peoples populating the former Soviet Union and the Balkans are not surprised by the turbulence and violence in this part of the world in recent years. Some differences between black societies in Africa and in the United States may be attributable to slavery. A historian's role is the bring order out of a jumble of events so that lessons can be drawn from them for application to today's problems. In order find meaning in past events, facts must be organized in a logical manner. Suppose you gave someone copies of every edition of Atlanta's newspapers between 1900 and 1970 and asked them to construct a picture of what life was like there during this period. Would any two people's descriptions be identical? How accurate would any of them be? Clearly, differences in people's ability to organize and evaluate information, their beliefs, and the quality of judgment will lead to differences in how they portray this period. It is, of course, impossible to gain a perfectly accurate picture of a period because what appears in newspapers and in other records is not a random sample of what was going on. Most of what went on during this period did not appear in newspapers. Even some significant events may not have appeared. Two people can look at a society and come to different conclusions about the cause of its problems because of differences in their perspective and expertise. Something an economist would notice and see the significance of a political scientist or sociologist might ignore or vice versa. The economic historian studying the United States faces many problems. A major problem is that the macroeconomic data in anything close to a reliable form is unavailable prior to 1843, and a large part of our economic history took place before this date. National Income Accounting, of course, dates only from 1929. Macroeconomic date is sketchy up until 1929 because it was not until the 1930s that the government began computing the nation's Gross National Product. (Today the nation's output of final goods and services is measured by what is called Gross Domestic Product.) Gross National Product was computed back to 1929 because adequate data to compute it went no further back. Relative to everything which happened in recorded history, all any one person can know is a bare outline, and this is of little theoretical or practical use. To know enough to be of either theoretical or practical use, you have to be selective. Up to a point, the more selective you are, the more useful is the knowledge gained. But, while an in depth knowledge of American popular music from 1920 to 1990 might serve a song writer very well, the much deeper knowledge of popular music this person could gain with the same amount of effort by considering only, say, popular music in 1934 would be of vastly less value to a song writer. None of this knowledge of music history would be helpful to someone interested in understanding how government works. Someone wanting to learn whether, over time, governments evolve, that is, if there is some pattern to government: perhaps a trend overtime away from totalitarianism towards democracy, cannot confine himself or herself to studying the government of, say, Brazil. This person will have to study all governments over time. On the other hand, if somebody wishes to learn whether changes in government in the U.S. are random or display some trend, other countries' governments will be ignored. A politician like my former colleague, Newt Gingrich, who wants to increase his chances of being a great speaker of the U.S. House of Representatives will study, not crime in London in the late eighteenth century or the development of the railroad industry in the nineteenth century; instead, he will study past speakers of the House of Representatives. There is, in short, a need to study history from some perspective, highlighting one theme or aspect. There are innumerable possibilities. In this course the perspective is economic. This choice causes us to view events from a perspective different from that of other, more typical, courses in American history. Economic history's cast of characters features business leaders, working men and women, and inventors; not the usual parade of presidents, generals, etc. Its plot ignores the great epic of American democratic development and dwells instead on the less familiar ebbs and flows of economic activity. Technology plays a role as central as political processes play in the typical history course. Major events like the War Between the States (Civil War) are background, rather than foreground, events. Events such as the formation of the Sears, Roebuck Company or the building of the Erie Canal mentioned in passing in other history courses, are focused on in an economic history course. We study history from this perspective because it has an extraordinary power of illumination. This is a broad perspective because it touches more on other perspectives than many of them do. Economists' objective is to understand the forces and institutions that determine mankind's material well being. They study how resources are allocated; how and what goods and services are produced; and how they are distributed to consumers. The economic historian is concerned with determining which methods of doing these things is the most economically efficient. The study of economics is necessary because resources are scarce. Because they are scarce, they need to be used with maximum efficiency. History furnishes us with examples of how resources can be allocated. They can either be centrally allocated or allocated through a market or via some mix of these two methods. The first reason for studying economic history is to be able to understand the historical context within which current activity takes place. A second reason for studying economic history has to do with the fact that economics is not an experimental science. Economic theories cannot be tested via controlled laboratory experiments. The only way to test economic theory is to see if they are supported by what has happened in the real world. A third reason is in order to compare and contrast the performance of different types of economic systems. The historian studying American economic history studies the changes in the production, distribution, and consumption of goods and services in the United States over time. An economic history course covers many of the topics covered in the typical American history course, but they are viewed from a different perspective. All historians are concerned with the practice of slavery in the United States, but economic historians is more concerned with issues such as was slavery profitable; what role did it play in causing differences in the standard of living and industrial structure of the South as compared with the rest of the nation; and whether it retarded economic development. The economic historian is also very much concerned with how efficient slavery was in producing good and service. Also: What was the economic condition of slaves? What was the economic impact of ending slavery on the South? Was slavery uneconomic in the North? Economic history is both the seed bed for economic theories and their testing ground. What happened in the past may lead to theories as to why they happened. Theories about why, under given circumstances, certain things should happen can be tested by observing what happened in the past when such circumstances existed. All economic activity takes place in a social setting made up of social institutions, habits, beliefs, and values, and it is as important to understand how these institutions emerged and how the structure of societies change over time as it is to concentrate only on those activities that are somehow measurable. Some economic historians, like other historians, think that history was cyclical, while others, like Karl Marx, viewed it as a linear progression. The first seven of these interact with each other and substantially explain the eighth (economic growth and development). There are a host of cause and effect relationships between economic history and political history, science history, the history of technology, cultural history, and military history. Economic history may be narrative of analytical in form. The analytical approach tends to be highly quanatified. Economics was the first social science to introduce highly quantified analysis. Highly quantified general history is called cliometrics. Because extensive quantitative economic data is a recent phenomenon, and quantative data peters out rapidly as you move further and further into the past, this is not an effective method of studying the distant past. Practitioners of cliometrics believe their method is superior to other methods because it is more objective, and in some cases they have been able to rather convincingly overturn the conclusions reached by earlier economic historians who relied on subjective, non-quantified information. On the other hand, many believe that understanding the past requires consideration of qualitative aspects of economic life which are not quantifiable. Proponents of traditional economic history believe that rich, descriptive studies of historical phenomena impart more of the flavor and impact of what happened than do the so-called objective, statistical and theoretical studies that they believe are subject to substantial error largely due to inadequate data. Also, they believe such work fails to impart a feeling for what really happened in the past. Economic history and economic growth and development are three closely related sub-disciplines of economics. Both growth and development economics have a strong policy orientation. Economic growth theory is the most analytic, as it attempts to abstract from reality in order to develop theories about how and why economic growth takes place. Economic development, on the other hand, attempts to understand the process of material development. It seeks to learn why some countries are more developed than others and why and how countries develop. Both these sub-disciplines--particularly the latter--depend on economic history, that is, what happened in the past. One cannot define exactly where economic history ends and economic development starts. It is not surprising that a Georgia State University economist who was recognized as the most accurate economic forecaster in the United States majored in economic history. This is because your only guide to what will happen is what has happened. The study of economic history can help us understand economic analysis. But while much economic analysis is static, economic history is concerned with changes which have taken place over time. By tracing the structural changes which have taken place in an economy, it is possible to understand the emergence of today's society. Click here to discover what the discipline of economics is about. The above material is based on material from a variety of sources read by the author over the years she taught this subject. Pictures used in this material are from the American Memory Collection of the Library of Congress. 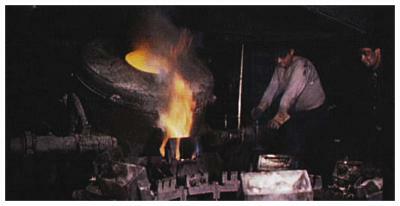 Top Picture: Casting of pig iron at the Sloss City furnaces, Birmingham, Alabama. Picture Below Picture of Steam Locomotive: The casting of a billet from an electric furnace, Chase Brass and Copper Company, Euclid, Ohio.